The Stables is situated 4 miles inland from picturesque Cemaes Bay and a short drive from Amlwch. Shops, takeaways and pubs serving food can be found in both Cemaes Bay and Amlwch. Cemlyn Bay is a short distance away a beautiful National Trust Reserve a naturalists paradise for birdwatching, seal spotting and many of our native mammals are also spotted there eg hares, foxes. The cottage is within easy distance from Llyn Alaw for bird watching, fishing, walking. There is an excellent beach in Cemaes Bay. Signposted scenic cycle routes on Anglesey can also be picked up near to the cottage. Welcome to the ‘Copper Kingdom’, where the miners were already busy in the Bronze Age, perhaps 4,000 years ago. 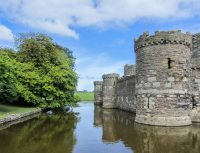 Beaumaris was the last of Edward I’s ‘iron ring’ of castles along the North Wales coast.